Create a farmers market. 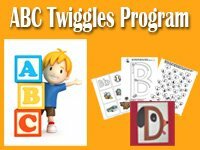 Place different sized baskets or boxes, real or plastic fruits and vegetables, crates, brown lunch paper bags, a scale, a cash register, play money, pencil and paper, straw hats, and flannel shirts in your pretend play area. 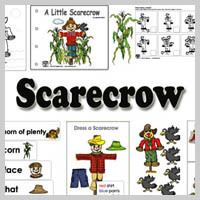 Add farm machines, a large piece of brown felt, small plastic toy vegetables, corn kernels and beans, small baskets, scarecrows, and some small straw bales to your block center. 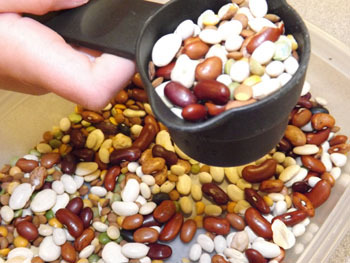 Provide different seeds and and beans, small containers, and different spoons. 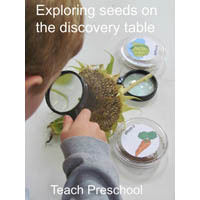 Let children use magnifying glasses to look at the different seeds and then sort and fill them in the containers. 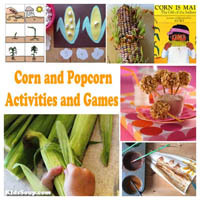 Let children use tweezers to pick the corn kernels from a dried corn cob. 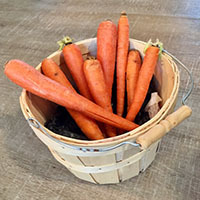 Provide differet root vegetables (potatoes, radish, carrots, and some pumpkins) together with some vegetable brushes and some towels. 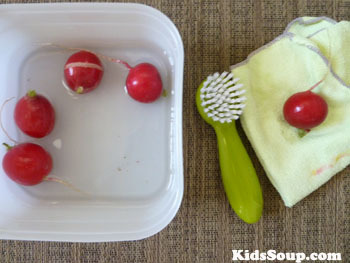 Let children use the brushes and towels to clean the vegetables. Set out a supply of different colored play dough. 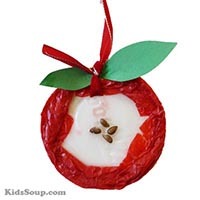 Encourage children to create all kind of fruits and vegetables. Visit a local farmers market. Let children buy some items. Later, have them wash and dry the fruits and vegetables. 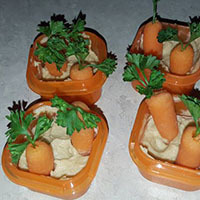 Place one or two different fruits or vegetables into a small brown lunch bag. Give each child a bag. 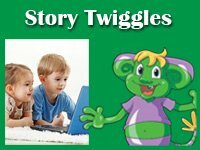 Have children take turns reaching into their bag without looking inside and describe how the fruit or vegetable feels (soft, hard, rough, smooth, round, etc.). Encourage them first to guess what it is, and then take it from the bag to reveal what it is. Think of a fruit or vegetable and say," It's an orange. Mmm . . . a yummy orange." (Have children rub their bellies.) "An orange grows high up in a tree." (Have children reach up to pretend to pick an orange from a tree.) Repeat with different actions for the other fruits and vegetables in the bags. (Carrots--bend down and pull carrots, etc.). 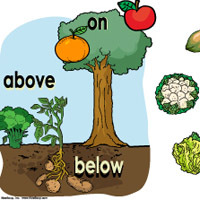 Help children answer these questions about their fruits and vegetables, one at a time: What does it look like? (like a tree, a ball, a leaf) Is this fruit/vegetable big or little? How does it feel? (smooth, rough, hard, soft, bumpy, cold, warm, crinkly) What color is it? 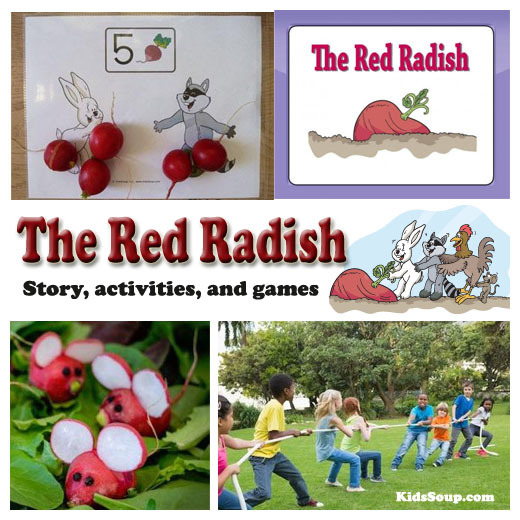 Other questions to ask: Do you know an animal that eats (name the fruit or vegetable)? Where do you get the (name the fruit or vegetable) you eat at your house? Does anyone at your house cook (name the fruit or vegetable)? What is your favorite fruit? What is your favorite vegetable? 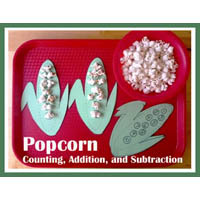 Cut up the fruits and vegetables that you have and let children taste them. Make sure that children wash their hands before they eat. 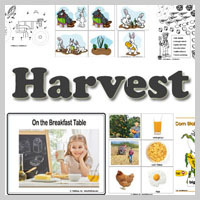 Let children choose a vegetable or fruit card and color it. 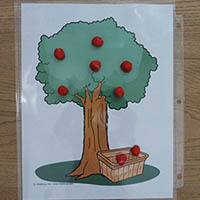 Then, have each child show her/his card to the group and name the fruit or vegetable and its color. Together, say per example, "The apple is red and Milo's shirt is red." 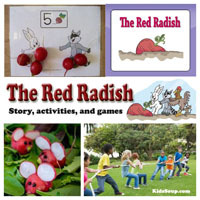 Invite children to look around the room to find some other items that are red. Read the book: Growing Vegetable Soup (Voyager Books) . 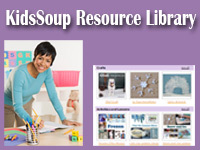 Show children the recipe for a vegetable soup. Place the different vegetables inside a bag. 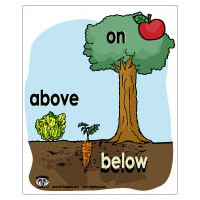 Grab one of the vegetables and describe it to children. 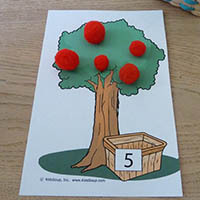 Let children guess the vegetable and then place it inside the basket. Continue until all vegetables are in basket. 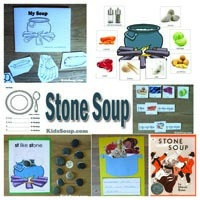 Together with children, prepare the vegetables to make a vegetable soup together. 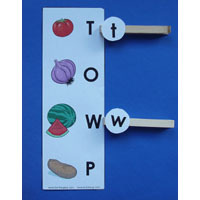 Have each child choose a favorite fruit or vegetable card and place it in the appropriate column. Discuss the results. Fruits and Vegetables Introduction Read the book Gregory the Terrible Eater by Mitchell Sharmat. 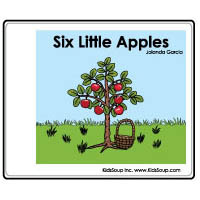 This is a hilarious book about a boy named Gregory who wants to eat fruits and vegetables, and his parents who are more excited about tin cans and tires. 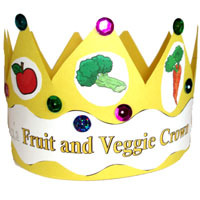 Talk about how eating fruits and vegetables helps us grow and stay healthy. Fruits and Vegetables Are Good for Me! fruits are sweet for me and you. 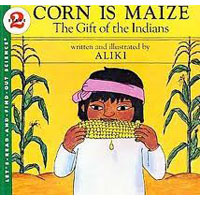 Read the book Tops & Bottoms (Caldecott Honor Book) . Let children act out the story. Revisit the story Tops & Bottoms. Cut out different fruits and vegetables pictures from grocery store flyers. 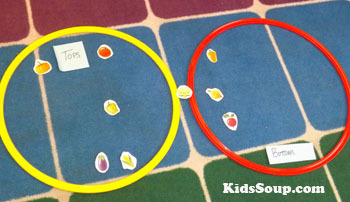 Let children sort the fruits and vegetables in to the two groups :Top / Bottom. 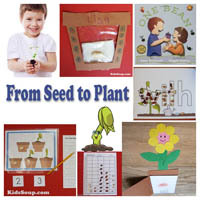 Discuss with children what seeds need to grow (soil, sunlight, water). 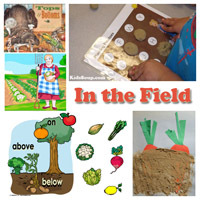 Let children pretend to be a seed in the ground. 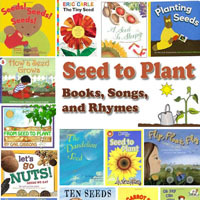 Play some light music and walk around the children with a watering can pretending to water each seed. 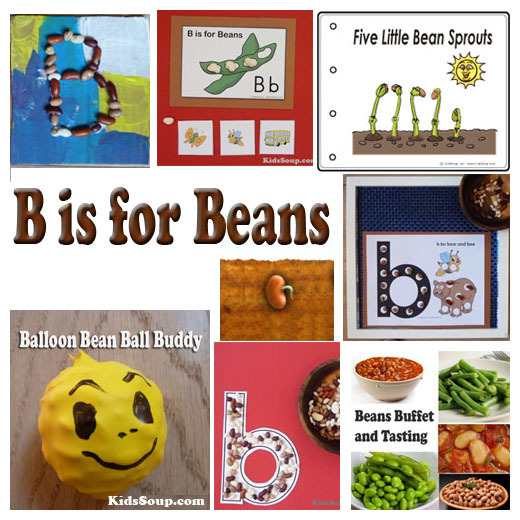 Everytime you water the child, the bean plant is growing bigger and bigger. 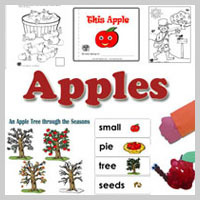 Show children a red, a yellow, and a green apple. Make a graph about their favoirte apple color. Then, let children taste the different apples. Which one did they like best? 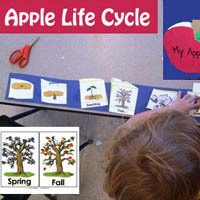 Discuss with children the seasons of an apple tree and place the pictures in order. 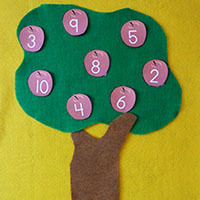 Let children draw an apple tree and write about it. 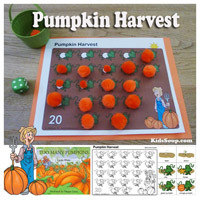 Provide a variaty of pumpkins in different sizes and shapes. Provide measruing tapes, yarn, scales, and a magnifying glasses. 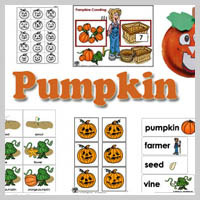 Let children explore the different pumpkins. Which pumpkin is the largest? The smallest? The heaviest? 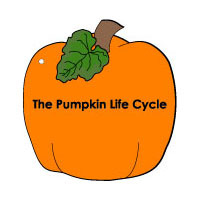 Let children feel the outside and explore the inside of a pumpkin. How does it look, smell, feel? 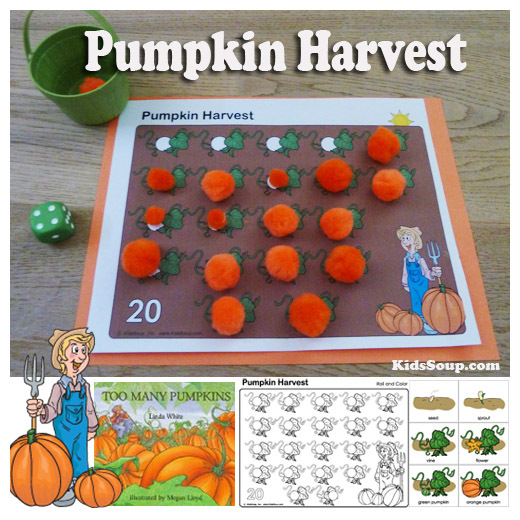 Remove the pumpkin seeds together and roast them for a yummy snack. Show children pictures of food made out of potatoes (French fries, chips, mashed potatoes, potato salad). 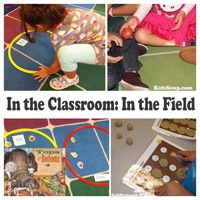 Pass a potato around the circle and let children feel and smell the potato. How does it feel? How does it smell. Play hot potato. 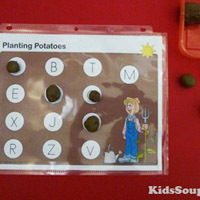 Play some lively music and let children pass the potato around the circle. Stop the music. The child holding the potato names a food made out of potatoes. Put a sweet potato in a glass of water or a plastic container, half in and half sticking out. 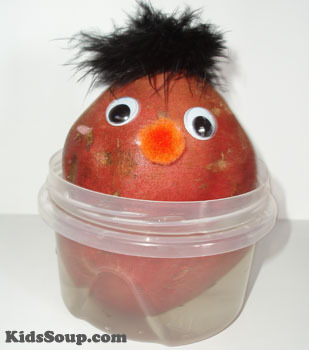 Glue on wiggly eyes, a pom-pom, and a piece of black feather boa to make a potato man or woman. Add water from time to time and soon you will see a vine that begins growing. 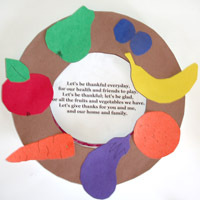 Directions: Have children cut out pictures of fruits and veggies and glue them onto construction paper to make a fruit and veggie collage. 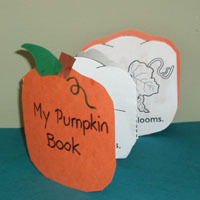 Carrot Bookmark Craft Draw or trace carrot shape onto orange craft paper. Ask children if they know which two colors make orange. Place a little of yellow and red paint on a paper plate and have children stir and mix the colors until they get an orange color. Cut a real carrot to get a round carrot stamp. Use carrot to stamp the orange color on the carrot outline. Let dry. 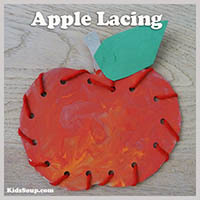 Draw carrot leaf and attach a pipe cleaner with staples. When dry, cut out carrot shape and glue leaf with pipe cleaner on the carrot. Use staples to strengthen.